PHOTO CAPTION [FROM LEFT: Paige, Heather Kemper-Hussey, Lindsey, Erin Suelmann]: On Tuesday, April 19, 2019, The Expert Realty Company (Heather Kemper-Hussey, Director of Public Relations) presented a $1000 check to Down Syndrome Association of Greater St. Louis (Erin Suelmann, Executive Director). 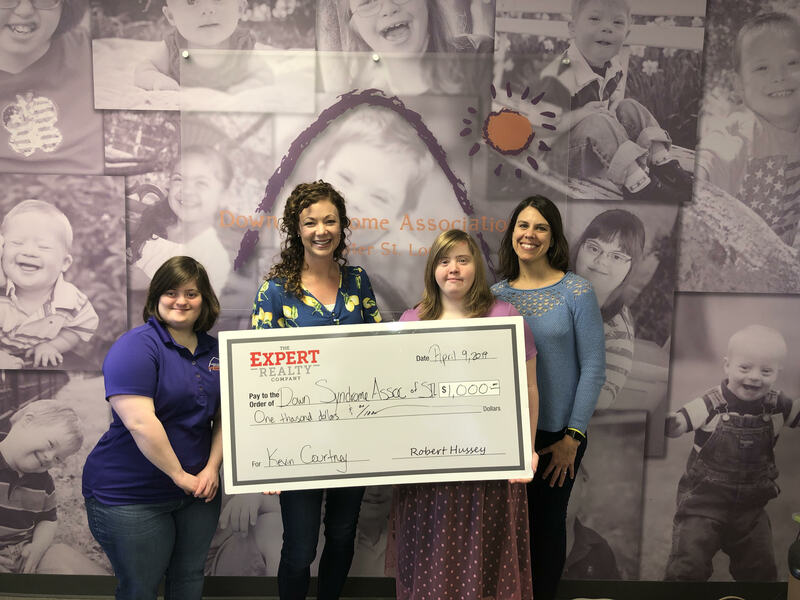 ST. LOUIS METRO AREA – On Tuesday, April 9, 2019, Heather Kemper-Hussey with The Expert Realty Company presented a $1000 check to Down Syndrome Association of Greater St. Louis. This organization was nominated by Expert Realty client Kevin Courtney for the organization’s efforts to connect families, educators, medical professionals, and the community with information, programs, and resources for individuals with Down syndrome through every stage of life. Robert Hussey, Owner and Broker of The Expert Realty Company, pledged to donate a portion of their monthly commission to a charity nominated by their clients. The Expert Realty Company is a full-service real estate brokerage firm serving St. Louis metro area. Owner and Broker, Robert Hussey believes strongly in two things. First, providing expert realty service to their clients. And secondly, giving back to their community by supporting local charities. For more information, visit www.expert.realtor.